Foundation Masters, LLC can design a Hurricane Proof Home that can withstand a direct hit from hurricane winds or high winds of any kind. The round shape can provide the best resistance, but our Engineers can take your dream home and turn it into a Hurricane Proof Home without sacrificing the architectural design. Lets face it, most of us do not want to live in a doughnut. Foundation Masters, LLC will provide you with a free on site consultation and plan review. Foundation Masters, LLC is the Best home Builder in the Tampa Bay, Florida Area. When building a home in Florida one should always plan ahead for Florida weather and the harsh elements that come with Florida living. Below are some very important tips when designing a Hurricane Resistant Home. Cover your windows and doors regardless if you have impact-resistant glass, protecting doors and windows against high winds and flying objects/debris is imperative. When the wind enters the house the roof will be torn off from a suction of wind and uplift. Garage doors are a real weak spots for hurricane-force winds, the best way to secure these doors is to design additional bracing that can be installed when a hurricane is coming. Foundation Masters, LLC builds the best and safest Hurricane Proof Homes in Tampa bay to Venice Beach, Florida. Design for uplift protection. Hurricane-force winds can pull buildings apart with ease. Roof structures are particularly prone to damage, so using the correct construction fastening tie downs is a must. From tie-downs to lateral anchors, from hold-downs to embedded connectors, the choice of fastener will vary depending on design and materials used for construction. Remember the doors. Garage doors are real weak spots for hurricane-force winds. If the door gives way, the winds can enter the house and cause the roof to be torn off. Prevent this by making sure the garage door is installed to withstand these forces or brace an existing door to prevent its giving way. Be ready for water. Try to keep your basement or crawl space dry with a more-than-basic drainage and sump pump system. Create redundancy in the system with two drain tile layers as well as battery backup, or better yet, have sump pumps backed with emergency power. Keeping the power on. While you and your home will survive the storm, the power likely will not. Having a standby generator to produce electrical power is a must. While you can install a full house back up system, you don’t have to. If the generator is smaller and keeps only the essentials going, and protected from the storm you’ll be fine. Also, make sure to have plenty of the correct size batteries on hand. Always stay above water. 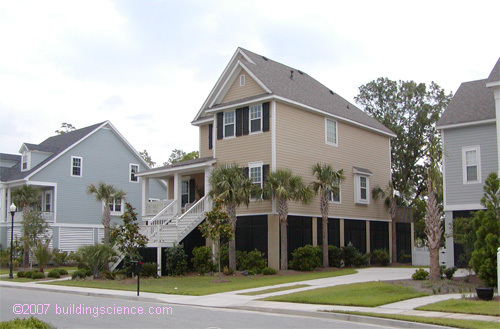 All building codes require for new homes in some coastal areas that the structure be raised. While garages and storage spaces can be placed on the ground floors of these homes, the construction should be such that the structure doesn’t block a storm surge. For a FREE onsite inspection and consultation for your Hurricane Proof Home with plan review call Foundation Masters, LLC Civil Engineers today 813-614-1718. If you need help with picking the right piece of property we can help you.